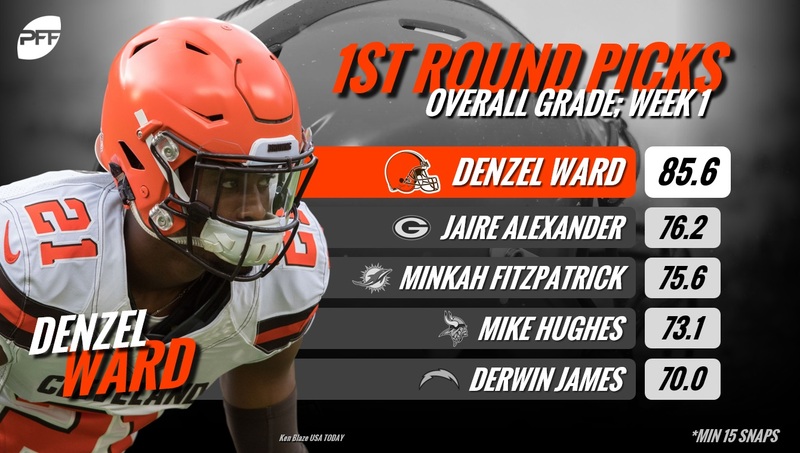 Week 1 of the regular season is in the books which means we’re officially through our first lap in PFF’s race for the Rookie of the Year award. Just like last season, we’ll be tracking the rookies all season long, updating you each week with where they stand among our top 10. Our grades will weigh heavily into the rankings (read this for more info on how we grade) but they aren’t all we consider when determining these rankings. Remember, this is a season-long race and after Week 1 we have a small sample of data to play with. These rankings are fluid and if the race this year is anything like it was in 2017 – just two rookies who placed in the top 10 after Week 1 were still there after Week 17 – we should be in for a fun ride. Without further ado, here are the top rookies following Week 1. The fourth overall pick had his hands full with Antonio Brown and the Pittsburgh Steelers offense in his professional debut and he certainly stepped up to the challenge. While Brown did get the best of him for a touchdown on a back shoulder throw that Ward was still able to contest, it was an impressive debut for the rookie. Ward finished the game with two interceptions, peeling off his coverage for the first one to dive in front of Antonio Brown with Pittsburgh in the red zone. Ward also recorded a pass breakup and two stops. The former Ohio State star exits Week 1 as our sixth highest-graded cornerback. We’ve made it two spots into this list and so far, we’ve got two Cleveland Brown defenders. Avery logged 44 snaps against the Steelers in his rookie debut and he exits Week 1 as our second highest-graded edge defender. Avery was disruptive as a pass-rusher, recording three pressures (one hurry, one hit and one sack) with one being a strip sack with 48 seconds to go in overtime that set up a game-winning field goal opportunity. Avery also recorded two run stops on 10 run-defense snaps, and his 20 percent run-stop percentage was the second highest among any defender who saw at least 10 snaps in run defense. 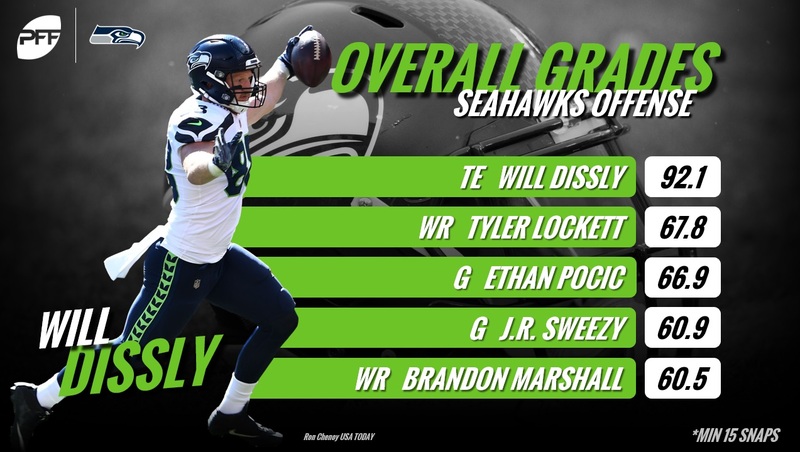 A fourth-round pick out of the University of Washington, Dissly currently owns the highest grade among tight ends after one week of football. The former Husky caught a touchdown in the first quarter against Denver on a nice play where he sold that he was pass-blocking before releasing downfield. He followed that up later in the quarter with another near touchdown after he forced multiple missed tackles on his way to a 67-yard gain. Dissly’s third catch also resulted in a Seattle first down. Bentley was our sixth-highest graded linebacker after the opening game, and he was one of just three linebackers to earn a run-defense grade of at least 80.0 (87.7) while also posting a coverage grade north of 75.0 (76.3). 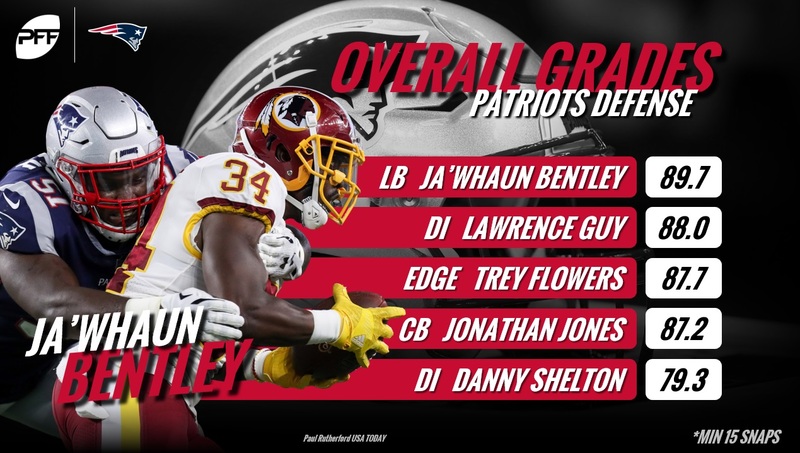 Among the nine rookie linebackers who saw at least 10 snaps in run defense last week, Bentley led the way with a 15.8 run-stop percentage and he was the only guy in that group to record multiple run stops while also not missing a tackle in run defense. Slotting one spot behind Bentley as our seventh-highest graded linebacker is 49ers linebacker, Warner who had an impressive pro debut in both run defense and coverage. The third-round pick earned a healthy 76.5 run-defense grade against the Vikings to go with an 82.2 coverage grade, the eighth-best coverage grade posted by a linebacker in the opening week. Warner was second among rookie linebackers with at least 10 run-defense snaps last week with a 10.7 run-stop percentage. Warner also made an impressive play to force a fumble, popping the ball free just as Vikings running back Dalvin Cook was about to get into the open field for a potential touchdown. Warner also recorded a pass breakup while in coverage. Our first and only quarterback to make the list, Darnold showed some resolve after throwing a brutal interception to start his career. The third overall pick currently ranks 16th among quarterbacks in terms of overall grade. Against the Lions, he was especially sharp when he was able to throw from a clean pocket. Darnold ranked fifth among all quarterbacks this past week with an 88.2 adjusted completion percentage from a clean pocket and he was eighth with a 123.4 passer rating on throws from a clean pocket. We didn’t have a single quarterback finish in our top-10 rookie rankings last season (though Deshaun Watson likely would have had he not gotten hurt). Will Darnold be the guy to prevent that from happening for a second consecutive season? Bates was on the field for 82 defensive snaps this past weekend, the second most among all rookie defensive players (trailing only Ward who was on the field for 85 snaps in a game with an entire extra frame). Bates is currently our ninth-highest graded safety. Bates was one of just two safeties this past week to record at least eight tackles without missing a tackle and he allowed just a total of two yards on the three receptions caught in his coverage.